" As a complete beginner and non-exerciser, I went to Sarah's Pilates class for a taster session, wondering how I would cope. I need not have worried. Sarah took us through a routine from warm up , through the main exercises then ended with a cool down, in a very calm and relaxing manner. She made me feel quite at ease and very welcome, as did the other members of the group. I can't wait to start classes again in September!" 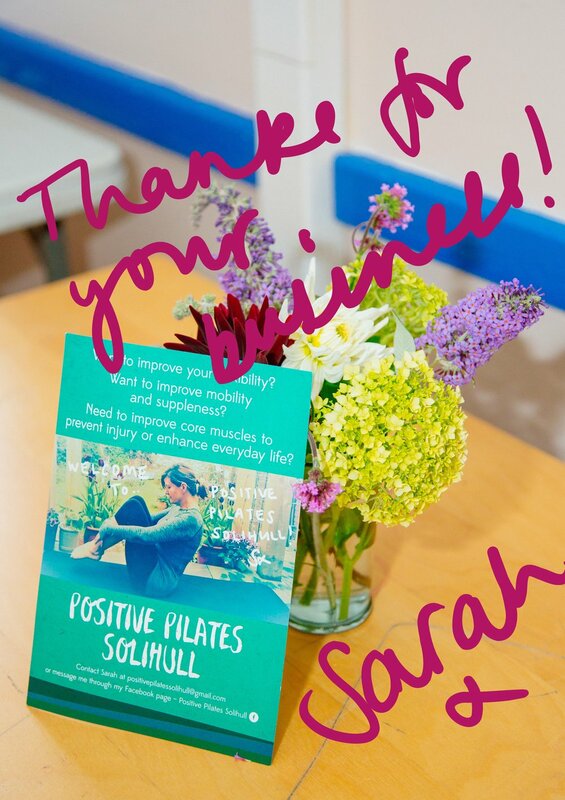 " I have so enjoyed going to Positive Pilate run by Sarah Edwards. I am in my late seventies when sore joints, bad backs and arthritis beset us! I have been amazed at the positive effect Pilates has had on my arthritic hip which was awaiting replacement. The surgeon who was to do my operation said Pilates, in his opinion, was a wonderful adjunct to analgesics and physiotherapy. Sarah leads the friendly classes which she prepares and delivers with much professionalism, and understanding of our bodies as we get older. I had my hip replacement 9 weeks ago and have just returned to Pilates aiming to gently get back to the core body work that supports the whole body and in my case the newly replaced hip. ". "Sarah's classes are super, she's so knowledgable and approachable. I wanted to join a Pilates class, but was wary of doing so, as I have limited movement due to a back problem. In a few short weeks, Sarah has guided me and given me confidence." "Work and home life are full on and this is my hour to break away and focus on just me and my body. Sarah delivers a well planned, calm and gentle class with clear and personal instruction that hits you right in the core! Thank you, Sarah." "Sarah is detailed and precise in her teaching and dedicated to ensuring the movements are undertaken correctly by all in the class. This gives me a thorough and challenging workout in a friendly and relaxed environment. I really enjoy and look forward to my weekly Positive Pilates session." "The classes are well planned, varied, informal and friendly and I have found that Pilates really helps my slight problems with lower back pain. Sarah is an excellent teacher - very professional, caring and fun!" "Have really enjoyed this energising class. Afterwards, I feel more relaxed and stretched. The group is friendly and Sarah is an understanding and encouraging teacher. Wonderful way to spend an hour of 'me' time!" "Pilates is a new lifestyle for me after starting with Sarah at Positive Pilates in a beginners class and I really feel the difference. It is stress relieving and relaxing, but you definitely work and I know my core strength has improved. Sarah is a great teacher, so natural, and her classes are really enjoyable. There is no distracting music, just Sarah's gentle encouragement and teaching. I'd definitely recommend it."